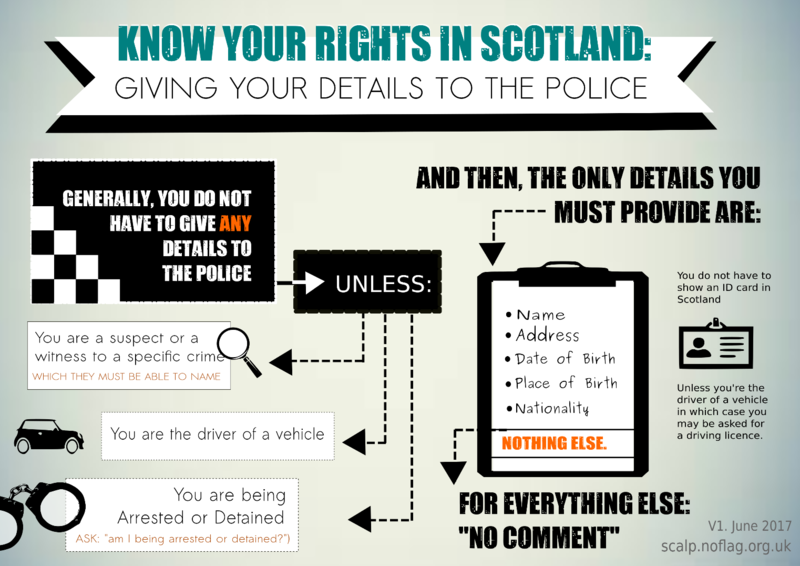 The following infographics are made specifically to deal with Scottish police, conditions may apply based on region. Generally, you do not have to give any details to the police, unless: You are a suspect or a witness to a specific crime (Which they must be able to name), you are the driver of a vehicle, you are being arrested or detained (ASK: "Am I being arrested or detained?") and then, the only details you must provide are: Name, Address, Date and Place of Birth, Nationality, Nothing Else. For everything else: "No Comment." You do not have to show an ID card in Scotland, unless you are the driver of a vehicle in which case you may be asked for a driving license.